It has been stated that people learn more from their failures than their successes. I believe this is true, but I wish (in the case of food), that learning didn’t involve such a dent in my wallet. Nothing makes me angrier than spending time and money to make a recipe, and then have it turn out tasteless, or even worse, inedible. Tonight’s meal wasn’t that bad, but it was quite a disappointment because of a silly substitution I made. I tried to make a version of a Spanish-style supper that I saw Curtis Stone prepare on an old episode of “Take Home Chef,” you can view the original recipe here. 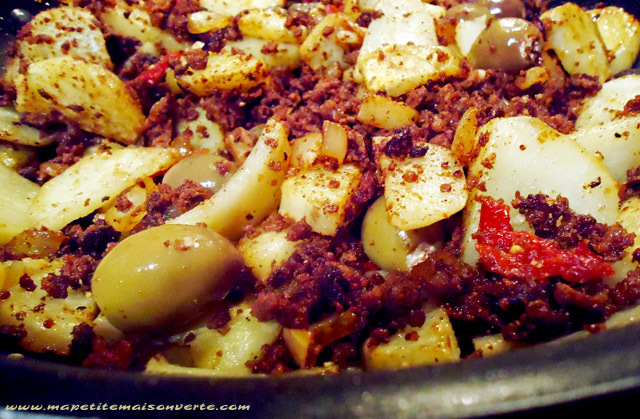 I didn’t write all the ingredients down verbatim, but Curtis used potatoes, sliced onions, tomatoes, green olives, and chorizo to create a delicious-looking meal. I decided to use potatoes, 1/2 a chopped onion, sun-dried tomatoes, delicious and pricey green olives, garlic, and chorizo. Pretty close to the original version, I’d say. BUT, my error was in the chorizo. The market didn’t have Spanish chorizo links like the recipe called for, but rather the soft Mexican chorizo that crumbles up similar to ground beef when you cook it. This substitution was a big error in flavor and consistency. To create the recipe, I broke up the chorizo and cooked it in a skillet, and added the chopped onions in the last 5-7 minutes of cooking to soften them. Then I drained the meat and wiped the pan with a paper towel to remove the annoying orangish grease. I cut up 5-6 medium peeled potatoes and pan fried them gently in olive oil, a sprinkling of ground coriander seed, salt, and pepper. I added about 2 cloves of minced garlic when about 7 minutes of cooking time remained. When the cut potatoes were fork-tender (about 15 minutes after beginning), I added a handful of green olives, and a generous tablespoon of jarred, julienned, sun-dried tomatoes with a little of the oil. I cooked the potato mixture a couple of minutes more and added the drained chorizo and onions back into the skillet to heat the meat thoroughly. The potato mixture was great, minus the chorizo. In fact, it would probably be a good, quick vegetarian meal or side dish. If you’re going to use chorizo though, make sure you buy the Spanish variety in a quality casing. I know I won’t make that mistake again!